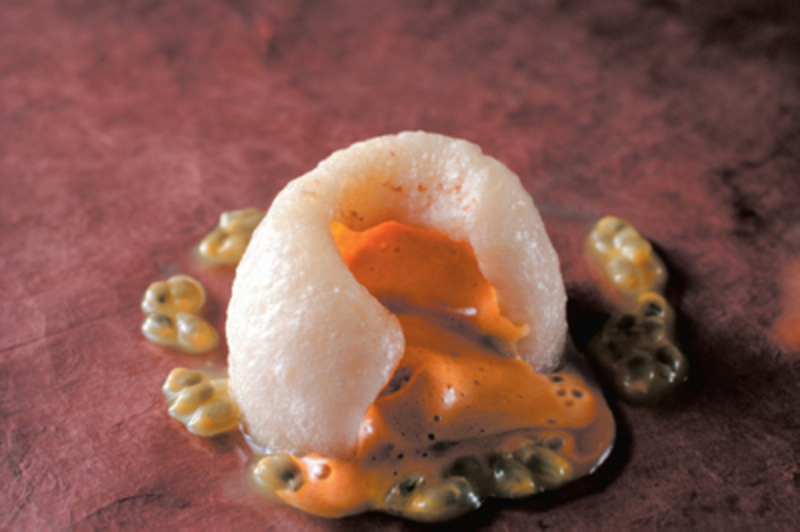 Coulant/soufflé of granadilla with cardamom toffee. Photo: Francesc Guillamet. ON JANUARY 4, 1931, under the drastic headline “Assails Macaroni as Bane of Italy,” the New York Times spelled out the consequences of the gastronomic revolution proposed by F. T. Marinetti in his “Manifesto of Futurist Cooking,” which had just appeared in Turin’s Gazzetta del Popolo and caused a stir around the world. Marinetti’s culinary polemic advocated the introduction of scientific methods in the kitchena “cooking laboratory” replete with chemicals, ultraviolet lamps, electrolysis, and the development of new devices such as the “ozonizer” to highlight olfactory sensations. A rapid succession of dishes, each containing but one mouthful or even a fraction of a mouthful, should replace the boring, heavy monotony of the classical Italian meal, he declared. Everything should be lightvirtually weightless.